Yep, you read that right. We woke up to snow on the ground this morning! Snow and what I had on the menu didn't pair well. Nevertheless, I made it. I'm a trooper like that. It was very good but it would have been better if we were sitting on the back porch in the early evening warmth with a Skinny Dip. Rather, we enjoyed it inside in the warmth of our furnace and a good bottle of Gran Calero - Monastrell 2008. Sometimes you just have to make do with what you have. 1 hard-cooked egg yolk, mashed - I left this out as I didn't have time. You see I watched Bounty Hunter and My Girlfriends Boyfriend. Both of which were bad movies but sometimes, that's what makes your day. Preheat oven to 450. In a medium bowl, combine shrimp, half the garlic, lemon zest, and 1 tablespoon oil and season with salt and pepper. Thread shrimp and bread onto eight 8-inch wooden or metal skewers. 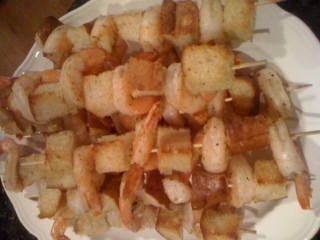 Transfer skewers to a rimmed baking sheet and bake until shrimp is opaque throughout and croutons are golden, 7 minutes. Meanwhile, in a large bowl, combine remaining garlic, lemon juice, 2 tablespoons oil, egg yolk, and mustard; season with salt and pepper. Whisk until well combined; stir in Parmesan. 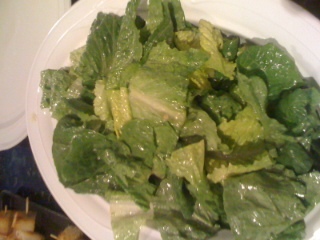 Add romaine and toss to coat. Sprinkle salad with more Parmesan and serve alongside skewers. Wherever you are in the world, I hope you will enjoy this recipe as much as we did! “Weather is unpredictable”, that’s the saying that could be applied here. Your original plans didn’t work out, but at least you found another way to enjoy the day with your loved one in a very romantic setting. :) So, I guess you can say that this was a blessing in disguise.